The Steel Haul is a 185 mile route on paved and unpaved roads to Armstrong County, Pa., and back. It features LRIs, NRIs, and changing MRDs. Open Controls and DIYCs are used to test contestants’ thorough understanding of the general instructions. The course is not fast; course following is the challenge. Scenery in the area is superb with many streams, valleys and beautiful vistas. The Laurel Run, written to the 2018 RRRs, is a 160 mile trip on paved roads primarily in Westmoreland, Indiana, Cambria, and Somerset Counties. Instructions are all in tulip format with mileages for each. Speeds will be quick. Passage controls are used for timing throughout the event. REGISTRATION for both events will be Friday April 27, 2018, 6:00PM to 9:00PM. Arrangements for late registration must be made in advance by e-mail to the chairman at jhutz@cmu.edu. HEADQUARTERS is the Super 8 Pittsburgh/Monroeville, 1807 Golden Mile Hwy, Pittsburgh, PA 15239. For reservations call 724-733-8008. 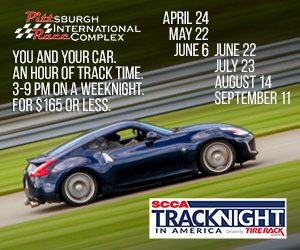 Mention SCCA to get the event rate of $79.99 plus tax. ENTRY FEES are $80 for either event or $150 for the weekend. Entries must be received by April 9, 2018. Car numbers will be drawn and General Instructions mailed on that date.